Australia’s national broadband network will cost taxpayers 24 times as much as South Korea’s but deliver services at just one-tenth the speed, new research claims. The opposition claimed the research vindicated its position that the NBN was a waste of public funds, while the government countered that comparing Australia to South Korea was “like comparing apples to oranges”. The research from the Economist Intelligence Unit published today shows Australia is spending an estimated 7.6 per cent of annual government budget revenues on its broadband network. 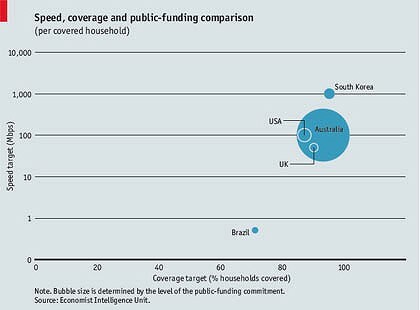 “In South Korea, by comparison, the government is spending less than 1 per cent of annual budget revenues to realise its broadband goals, achieving targets by encouraging the private sector to invest in the country’s broadband future,” the Economist Intelligence Unit said in a statement. However, the EIU report does not mention NBN Co’sannouncement last year that its network will also be capable of the same speeds as South Korea’s network. Shortly before the federal election, chief executive Mike Quigley announced the fibre network would be built to carry speeds of 1 gigabit per second in a bid to differentiate the project from the opposition’s broadband policy. The opposition seized on the report, with its communications spokesman Malcolm Turnbull saying that the Economist Intelligence Unit had “joined the long list of expert observers, both international and local, who are utterly dismayed by the reckless spending of the Gillard government on the NBN”. Communications Minister Stephen Conroy’s spokeswoman said comparing Australia to Korea was “like comparing apples to oranges”. “Investment in Australia’s road, rail, telecommunications and utility infrastructure faces vastly different factors than countries such as South Korea,” the spokeswoman said. Conroy’s spokeswoman also noted that Australia’s land mass was “over 7.6 million square kilometres compared with South Korea’s which is just over 100,000 square kilometres” and that Australia had a population density of “2.7 people per sq km compared with 487 people per sq km for South Korea”. The report also claimed that while Australia’s network scored highly for setting an original target speed of 100Mbps, Sweden, Finland, Estonia and France planned to achieve similar targets with much lower public-sector funding. The study reviewed more than 40 national government plans for broadband development. Australia scored 3.4 out of five on the index. It punished Australia for the “huge cost to the public sector of its broadband scheme”. Other factors that worked against Australia were “limited private-sector involvement, heavy central-government intervention and the exclusion of state and municipal authorities from its plan”, the Economist Intelligence Unit said.